Scientists from Nantes University Hospital have been researching standardised bench test evaluation of coronary stents and their biomechanical characteristics. The purpose of the study was to develop a standardised and global bench test protocol to evaluate the biomechanical characteristics of the most currently used drug‐eluting coronary stents. The use of coronary stents has contributed to the reduction of cardiovascular mortality but can be associated with specific complications. Improving the biomechanical matching between the stents and the coronary anatomy may reduce these complications. Flexibility (crimped and deployed stents) and longitudinal and radial resistances were evaluated using a TA.HDplus Texture Analyser. Biomechanical characteristics were significantly different for all tested devices. This should be taken into consideration to select the most appropriate device for each clinical situation. 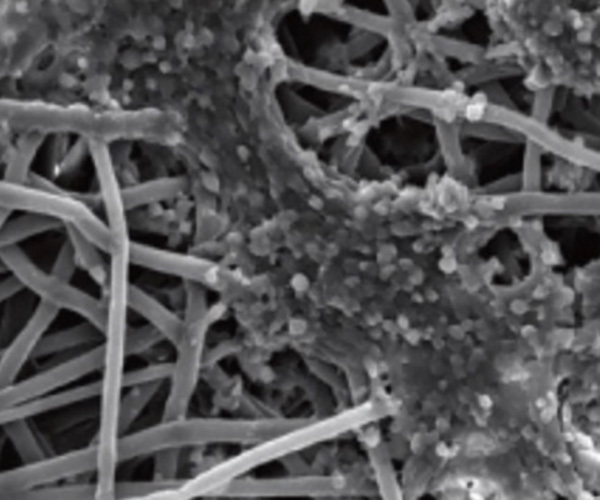 Scientists from the Swiss Federal Institute of Technology in Zürich have been performing a comparative study of cartilage engineered constructs in immunocompromised, humanised and immunocompetent mice. Choosing the best ectopic in vivo model for cartilage engineering studies remains challenging and there is no clear consensus on how different models compare to one another. The use of xenogenic cells can often limit the choice to immunocompromised animals only and so prevents the understanding of how tissue-engineered grafts perform with potential active inflammatory and immunological responses. The aim of this study was to evaluate the chondrogenic potential of a recently developed hydrogel in four mouse strains with varying immune systems. Scaffolds were tested under unconfined compression using their TA.XTplus Texture Analyser. The results of this study showed that it is possible to engineer a cartilage-like graft subcutaneously not only in immunocompromised, but also in immunocompetent and humanised mouse models. Researchers from the Federal University of Pelotas have been investigating a polysaccharide-based film loaded with vitamin C and propolis as a promising device to accelerate diabetic wound healing. Wound healing can be a painful and time-consuming process in patients with diabetes mellitus. In light of this, the use of wound healing devices could help to accelerate this process. In this research, cellulose-based films loaded with vitamin C and/or propolis, two natural compounds with attractive properties, were engineered. 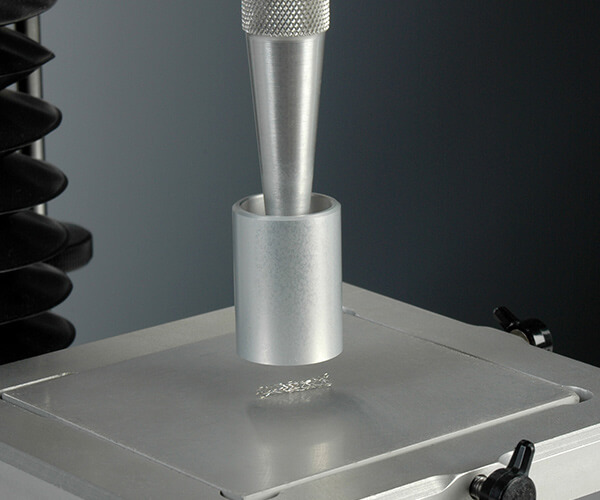 Mechanical properties were investigated by tensile testing using a TA.XT2 Texture Analyser. The results of this study showed that these novel eco-friendly films may represent a new therapeutic approach to accelerate diabetic wound healing. Not only does this create a lot of non-recyclable, non-biodegradable waste, but thin plastic films are not great at preventing spoilage – and some plastics are suspected of leaching potentially harmful compounds into food. Current food packaging is mainly petroleum-based, which is not sustainable. It also does not degrade, creating tons of plastic waste that sits in landfills for years – an issue that is now weighing heavily on the minds of all consumer after recent documentaries. To address these issues, scientists are now developing a packaging film made of milk proteins — and it is even edible. To create an all-round better packaging solution, Dr Peggy Tomasula and colleagues at the U.S. Department of Agriculture are developing an environmentally friendly film made of the milk protein casein. These casein-based films are up to 500 times better than plastics at keeping oxygen away from food and, because they are derived from milk, are biodegradable, sustainable and edible. Some commercially available edible packaging varieties are already on the market, but these are made of starch, which is more porous and allows oxygen to seep through its micro-holes. The milk-based packaging, however, has smaller pores and can thus create a tighter network that keeps oxygen out. After a few additional improvements within their research, this casein-based packaging looks similar to store-bought plastic wrap, but it is less stretchy and is better at blocking oxygen. The material is edible and made almost entirely of proteins. Nutritious additives such as vitamins, probiotics and nutraceuticals could be included in the future. It does not have much taste, the researchers say, but flavorings could be added. In addition to being used as plastic pouches and wraps, this casein coating could be sprayed onto food, such as cereal flakes or bars. Right now, cereals keep their crunch in milk due to a sugar coating. Instead of all that sugar, manufacturers could spray on casein-protein coatings to prevent soggy cereal. The spray also could line pizza or other food boxes to keep the grease from staining the packaging, or to serve as a lamination step for paper or cardboard food boxes or plastic pouches. Scientists from Mercer University (Macon, GA, USA) have been researching the effect of ablative lasers on in vitro transungal delivery. They used their TA.XTplus Texture Analyser to measure the mechanical strength of membranes after ablation using a needle penetration technique. The laser was found to disrupt the nail sufficiently to allow for permeation of methotrexate, which is otherwise challenging due to its high molecular weight and low permeability. Methotrexate is helpful in the treatment of nail psoriasis, so this study is key in showing that transungual methotrexate delivery is enhanced by fractional laser ablation. Scientists from Queen’s University Belfast have been researching the influence of an alginate backbone on the efficacy of thermo-responsive alginate-g-P(NIPAAm) hydrogel as a vehicle for sustained and controlled gene delivery. They used their TA.XTplus Texture Analyser to measure the injectability of hydrogel samples. The study developed an injectable and thermo-responsive hydrogel formulation for localised gene delivery. This helped to find an optimal Alg-g-P(NIPAAm) hydrogel with respect to localised delivery of DNA nanoparticles as a potential medical device for those with castrate resistant prostate cancer. Researchers from Lubrizol Advanced Materials have been investigating the prediction of lipstick sensory properties with lab tests. Sensory perceptions and performance are important to the success of a lipstick formulation, but in‐vivo evaluation can be expensive and time‐consuming. The goal of this work was to develop and use lab test methods to predict the sensory and performance properties of lipstick. The researchers used their TA.XTplus Texture Analyser to perform a tack test on the samples. 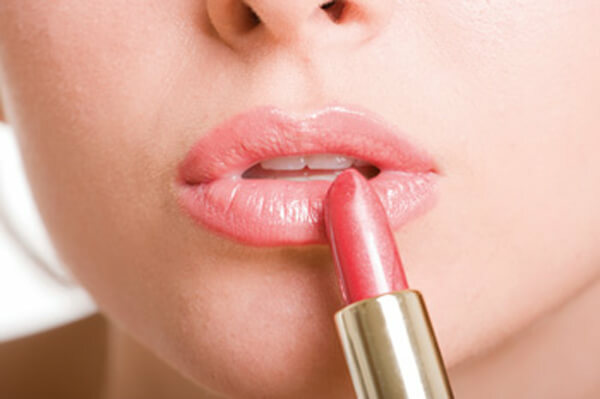 The emollient was found to have a significant effect on the sensory and performance properties of a lipstick, which can be predicted with the developed laboratory tests. The methods presented may help to speed up the development and optimisation of future lipstick formulations. 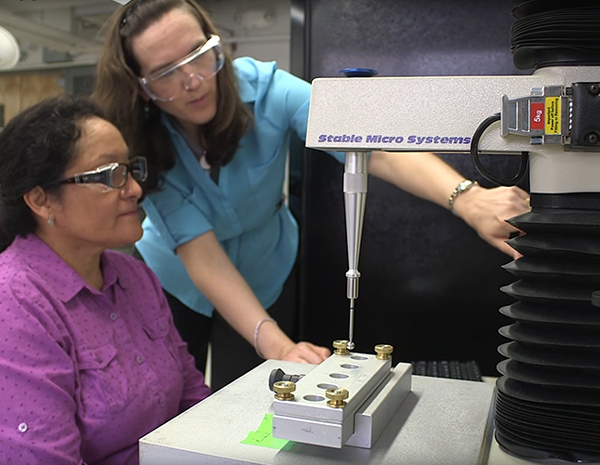 Researchers from 3M Corporate Research Materials Laboratory have been investigating the anatomy of the deformation of pressure sensitive adhesives from rigid substrates. 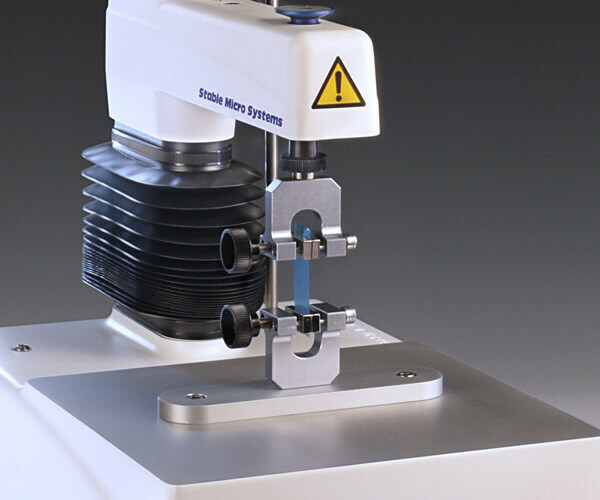 The extent of the deformation of any pressure sensitive adhesive (PSA) during debonding, which is independent if the failure occurs under tensile, shear or peel modes, has been widely recognised as a critical factor determining its capacity to instantly bond, hold a load or resist debonding. This paper attempts to decouple the three mechanistic steps of the lifetime of a pressure sensitive adhesive, namely bonding, holding, and debonding. The researchers used their TA.XTplus to obtain debonding profiles in a 90 degree peel testing mode, focussing on the adhesive high strain modulus (as dictated by its crosslinking level), the peel rate and the substrate surface free energy. The experimental results suggest that both substrate surface energetics and bulk properties intrinsic to large deformation of viscoelastic materials must be considered when investigating PSAs debonding phenomena. Adhesives are used everywhere, but how do we know how good they are or which one to use? Let’s outline some of the methods now used to put tapes through their paces. The value of the world market for self-adhesive tapes is set to expand at an annual pace of around 6.3% over the next few years, reaching $69 billion by 2022. 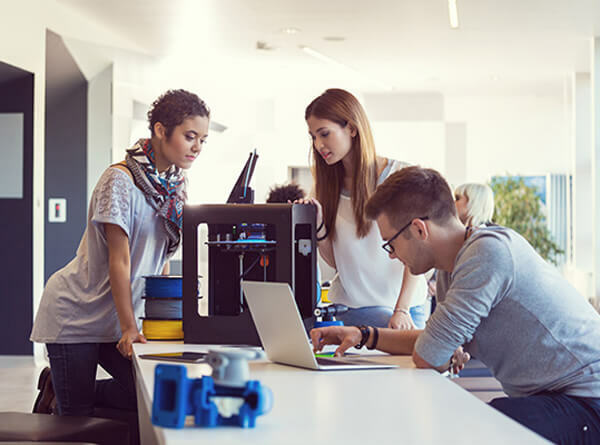 Opportunities abound across an array of industries, from packaging and non-residential construction to electronics manufacturing. Proven high performance will allow adhesive tapes to continue to compete against other joining, bonding and sealing technologies. However, as pressure on quality control departments steps up, it is essential to be able to assess accurately adhesive properties and strength to determine the ideal components for a particular tape and so optimise its performance. 3D printers — machines that can fit on a desktop and create 3D objects from plastics, metals, and other raw materials — can do just about anything. High-precision jets pump out custom medical implants at the press of a button. Carbon-fibre printers spit out automobile prototypes with jaw-dropping precision. And off-the-shelf modellers generate custom toys, jewellery, home decorations, and clothes with no more than a digital file. But there’s a new frontier in 3D printing that’s only beginning to come into focus: food. Recent innovations have made possible machines that print, cook, and serve foods on a mass scale. Industry leaders think 3D food printers could improve the nutritional value of meals, produce intricate sculptures out of everyday foodstuff, and solve hunger in regions of the world that lack access to fresh, affordable ingredients. There’s no doubt about it — 3D food printing has come a long way. Here’s the latest in food research that is using 3D printing and the TA.XTplus Texture Analyser to measure the results. Scientists from The University of Queensland have been researching the optimisation of chocolate 3D printing by correlating thermal and flow properties with 3D structure modelling. They used their TA.XTplus Texture Analyser, along with a custom break probe, to measure the snap force of 3D printed chocolate. The breaking strength of the samples was found to be strongly related to the support structure of the chocolate. This study demonstrated the use of flow enhancer and the inclusion of a support structure in the designed shape were key factors influencing printability capacity of chocolate. Meanwhile, at the University of Jiangnan, scientists have been investigating the creation of internal structure of mashed potato construct by 3D printing, and its textural properties. Although it is relatively a new area of research, most of the papers about 3D food printing have been focusing on the materials' properties or the printing variables on the 3D printing performance. Previous to this paper, limited information on the modified texture properties of printed samples is available, although the 3D printing technique has the ability to change the internal structure of printed objects by varying infill pattern and infill percentages. In this study, texture attributes of hardness and gumminess were obtained by texture profile analysis using a TA.XT2 Texture Analyser. The study confirmed that 3D printing has a potential to modify the textural properties of 3D printed samples through varying the infill percentage and the printing paths to fill the object, which possibly provides a novel way of tailoring textural properties of manufactured foods. Now that 3D-printing technology has become more vital and relevant than ever, Silicon Valley BeeHex has harnessed this technology (funded by a grant from NASA), to 3D print pizza. The purpose of this invention was to create a way for astronauts to select and product delicious food for themselves on missions. As manned missions to Mars become an ever-increasing possibility, astronauts might be spending much more time in space. To save space-goers from the drudgery of choking down freeze-dried, pre-packaged “space food” day after day, month after month, NASA decided it was time to develop a way to cook in space. As usual, they will need to make sure that all the key aspects of consumer satisfaction of the resulting printed food are in place and this is where a Texture Analyser comes in! At The Central University of Venezuela in Caracas, researchers have been researching active and intelligent films made from starchy sources and blackberry pulp. 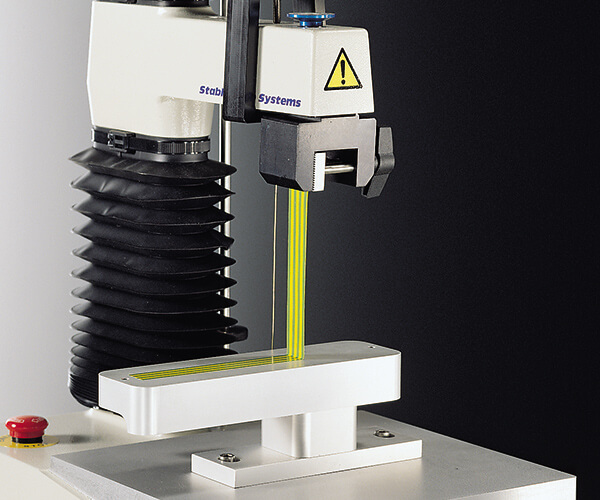 They used their TA.XT2i Texture Analyser to carry out uniaxial tensile tests on the films. The high toughness of films derived from plantain starch make them extremely useful for packaging, as they could be used to produce films that absorb more energy without this being transmitted to the packaged foods. This could minimise the damage caused by impacts to the food during transport and storage. Meanwhile, at the Horticultural Crops Technology Research Department, Giza, researchers have been investigating utilisation of orange wastes for production of value added products. They used their TA.XTplus Texture Analyser to measure the texture of osmotically dehydrated cubes of orange peel. After manufacture, waste from orange juices, concentrates and jam leave 10-15% waste out of the total production. This waste is a bad source of pollution, insects, and rats especially when left inside factories without removal. This study helped to develop the use of this waste in producing new products. Food companies are watching with keen interest as researchers in Japan delve into the nuts and bolts of sensations like "crispness" and "springiness". Their findings are expected to lead to new and more appetising products. Taste, aroma and appearance are important factors in determining the appeal of foods, but the finer details of the dining experience are still little understood. The researchers are working to uncover the secrets of food texture by gathering data on "mouthfeel" and the microstructures of various ingredients. Takashi Nakamura, a professor at Meiji University in Tokyo, is conducting studies on the springy textures of various kinds of starch. Each type has its own characteristics. Tapioca, commonly found in bead-shaped form in Asian milk tea drinks, and "waxy cornstarch," used as a thickener in Japanese sweets, are different forms of starch. Their chewiness is similar, but the "waxy" form is easier to bite through, while tapioca has greater elasticity. The experience of eating them is filtered through the senses, so formulating a numerical index presents a challenge. Quantifying 'crispy' and 'chewy' points the way to new and better products, according to Rimi Inomata of the Nikkei Asian Review. Researchers at the Technical University of Denmark have developed a novel, standardised method that can provide a quantitative description of shrimp peelability. 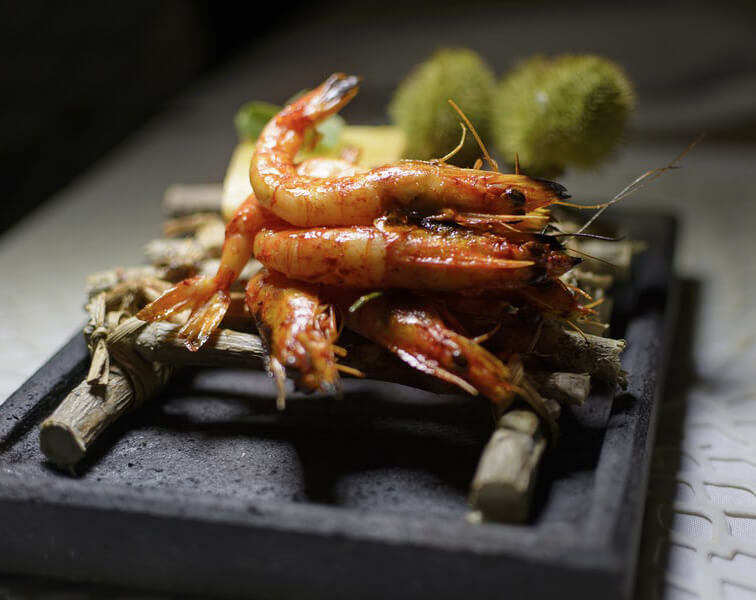 The peeling process was based on the measure of the strength of the shell-muscle attachment of the shrimp using their TA.XTplus Texture Analyser, and calculated into the peeling work. The self-consistent method, insensitive of the shrimp size, was proven valid for assessment of ice maturation of shrimps. The quantitative peeling efficiency (peeling work) and performance (degree of shell removal) showed that the decrease in peeling work correlated with the amount of satisfactory peeled shrimps, indicating an effective weakening of the shell-muscle attachment. The developed method provides the industry with a quantitative analysis for measurement of peeling efficiency and peeling performance of shrimps. It may be used for comparing different maturation conditions in relation to optimisation of shrimps peeling. This is yet another area in which the capabilities of texture analysis help food manufacturers and suppliers understand the detailed properties of their products. The boom of 2 billion people over the last century has resulted in an ageing world population. By 2025, the world will have almost 800 million people over the age of 65. About 556 million of them will be in developing countries, another 254 million in developed ones. In fact, the United Nations estimates that the global population age 60+ will soar from 11% in 2000 to 22% by 2050. While age is just a number, the numbers are certainly on the rise. Texture is often taken for granted. The acts of chewing (mastication) and swallowing play a huge role not only in nutrient intake, but also in an enjoyable eating experience. This becomes difficult when dental health starts to degrade and salivary flow diminishes. Missing teeth and wearing dentures both impact the act of chewing and decrease biting forces. Chewing efficiency can also be affected by a decrease in biting and chewing forces attributed to age-related changes in muscle strength. About 40% of elderly people have difficult chewing and swallowing food, and this difficulty has an obvious flow on effect for their health in terms of nutrition, wellbeing, and general quality of life. Scientists from Ruakura Research Centre have been investigating novel meat-enriched foods for older consumers. They used their TA.XTplus Texture Analyser to measure bread texture and ice cream meltability. 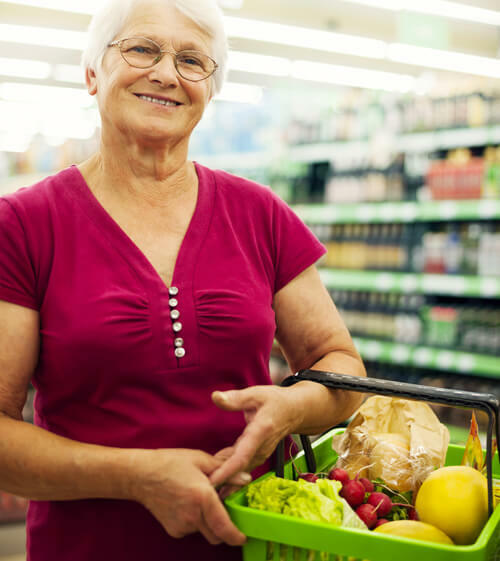 The study helped to develop products that elders could readily consume to meet nutrition requirements and address some of the common ailments associated with aging, such as loss of muscle mass and strength. Meanwhile, at Université Bourgogne Franche-Comté, scientists have been researching the relationships of oral comfort perception and bolus properties in the elderly for sponge cake and brioche. 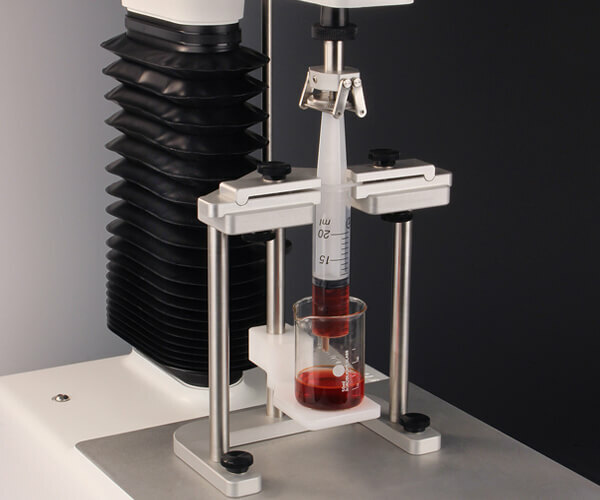 They used their TA.XTplus Texture Analyser as a capillary rheometer by equipping it with a cylindrical piston with a capillary die attached to the bottom along with a cylindrical barrel. Boli were loaded into the capillary die immediately after collection from human subjects. They found that for soft aerated cereal foods, stimulated salivary flow rate is the most important physiological variable that impacts the food bolus properties and the perception of oral comfort in the elderly, even more than the dental status. However, increasing the amount of fat seemed to lower the role of the stimulated flow rate and bolus hydration, likely by increasing lubrication. This highlighted the importance of the hydration and lubrication mechanisms in the oral processing and enjoyment of eating for this type of product in the elderly. 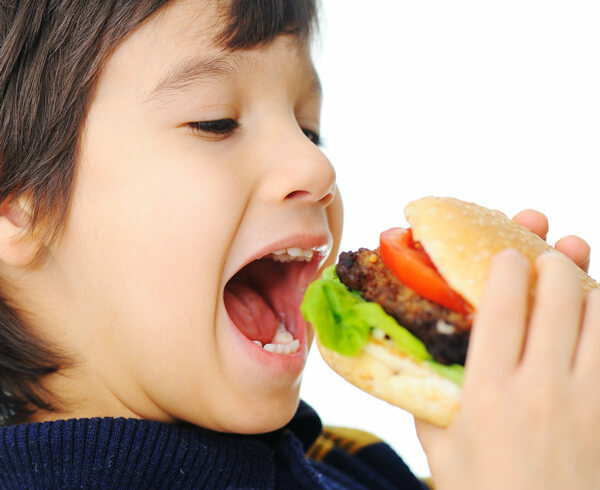 How to make food more palatable while still easy to swallow is an area of ongoing research. By applying rheology, developing new texture models, and looking at the nutrition and swallowing behaviour of foods, a more scientific approach can be brought to the formulation and design of novel texture-modified food. At the Institute of Agrochemistry and Food Technology, Valencia, scientists have been investigating insects as ingredients for bakery goods. Due to a rising demand for proteins, the food industry is considering new alternative protein sources that can be used for human food. The aim of this research was to explore the potential use of insect flour as a protein-rich ingredient for bakery products. The insects were ground and used to replace 5% of the wheat flour in doughs and breads. This affected rheological properties of the dough during mixing but did not significantly affect specific volume or texture. They used their TA.XTplus Texture Analyser to perform TPA tests on central bread slices. Meanwhile, scientists from the University of Foggia have been researching the printability, quality and nutritional properties of 3D printed cereal based snacks enriched with edible insects. Mechanical properties of 3D printed snacks were measured using their TA.XTplus Texture Analyser. Printed snacks reproduced the overall structure of the designed object with sufficient fidelity. However, the addition of different levels of ground larvae of yellow mealworms modified the printability of dough, changing morphological and microstructure properties of raw snacks. The overall results suggested that together with wheat flour, ground yellow mealworm could be a suitable ingredient to manufacture 3D printed foods with specific designs and improved nutritional quality without adverse impact on technological quality. Scientists from California State Polytechnic University have also been researching the effects of edible insect ingredients on the physicochemical and sensory properties of extruded rice products. They used their TA.XTplus Texture Analyser to perform hardness and adhesiveness assessments of the samples. Overall, the insect rice was found to have darker colour than the reference brown rice and to be softer and stickier in texture after cooking. As a staple food providing 20% of the world’s dietary energy and consumed by more than 1 billion people, rice is an ideal vehicle to deliver nutrients carried by edible insects. The incorporation of insect flours in processed foods such as extruded rice products can greatly promote the consumer acceptance by disguising the ‘yuck’ factor associated with intact insects and this study showed that the texture of these products is not adversely affected by incorporating insect ingredients. 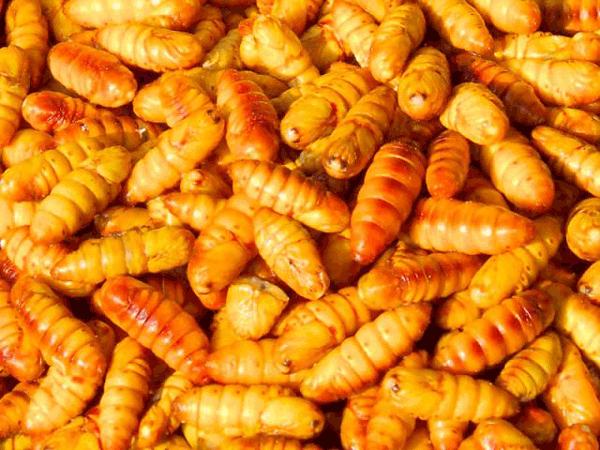 Insect innovation: Getting the right flavour and texture for your product is an online article including a report on some Finnish research on the best ways to process mealworms and crickets to get the optimal flavour and texture profile. Scientists from the Technical University of Munich have been investigating the classification of puffed snacks freshness based on crispiness-related mechanical and acoustical properties. They used their TA.XTplus Texture Analyser to perform sound-insulated crushing tests on samples equilibrated at different humidity levels. Crispness is a very challenging property to measure using texture analysis alone, and so this study combined 70 different food properties via machine learning algorithms. Sensory panels then ranked crispiness-related freshness and preference based on the recorded sounds. Selected feature combinations were used to train machine learning models to recognise the freshness levels at different humidity levels. The classification accuracy was improved compared with traditional texture analysis techniques and an accuracy of up to 92% could be achieved. Scientists from Mustafa Kemal University have been researching the assessment of acoustic-mechanical measurements for the crispness of wafer products. 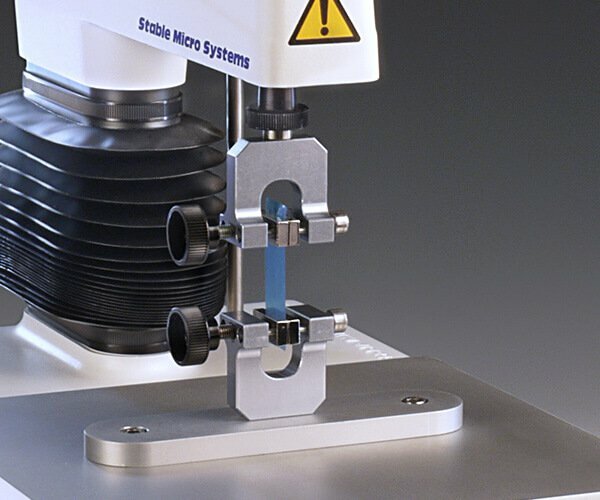 They used their TA.XTplus Texture Analyser along with the Acoustic Envelope Detector to perform mechanical and acoustic fracture measurements on wafer samples – three point bend tests and a craft knife cutting test. Both tests were found to be able to distinguish acoustic-mechanical properties of wafer products; wafers’ crispness could be differentiated by the parameters of the cutting test and their creaminess was related to mechanical parameters of the three point bend test. Force peaks number and maximum sound pressure showed correlation on both tests. The study showed that these techniques are capable of differentiating crispy products of different qualities, in different ways. Researchers from Osaka University have been developing novel double-decker microneedle patches for transcutaneous vaccine delivery. Two types of patch were assessed. Mechanical failure tests were performed with a TA.XTplus Texture Analyser. Each patch was loaded until failure. The required force for mechanical microneedle fracture was measured and the necessary fracture force per needle was calculated by dividing the measured fracture force by the number of fractured needles. Meanwhile, scientists from Queen’s University Belfast have been investigating novel bilayer dissolving microneedle arrays with concentrated PLGA nanomicroparticles for targeted intradermal delivery. They used their TA.XT2 Texture Analyser to measure the mechanical and insertion properties of nano- and microparticle-loaded microneedle arrays. These delivery systems continue to receive growing attention due to their ability to bypass the skin's stratum corneum barrier in a minimally-invasive fashion and achieve enhanced transdermal drug delivery and “targeted” intradermal vaccine administration. This study developed a two-stage novel processing strategy to provide a simple and easy method for localising particulate delivery systems into dissolving microneedle arrays. 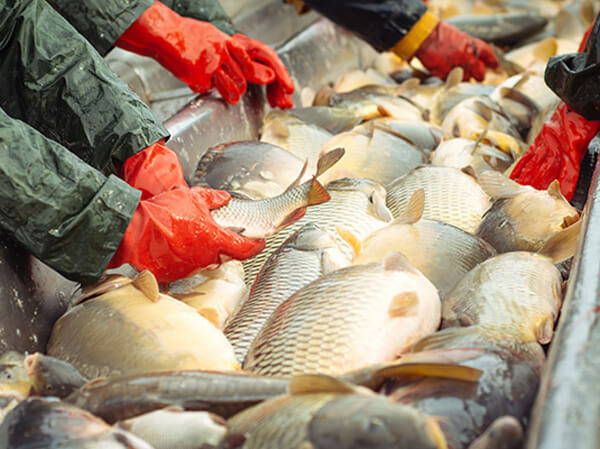 Researchers from Federal Fluminense University in Brazil have been investigating instrumental texture parameters as freshness indicators in five farmed Brazilian freshwater fish species. The aim of this study was to assess the chemical quality and instrumental texture parameters of the samples. 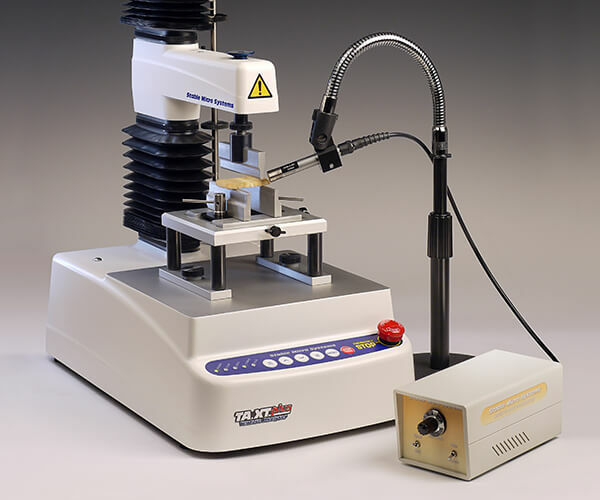 Texture profile analysis was performed on standardised size fillets using their TA.XTplus Texture Analyser. They found that with regard to the instrumental texture parameters, firmness, hardness, and chewiness decreased at the beginning of the storage period, whereas an increase was observed in springiness. All instrumental texture parameters demonstrated high correlations with ammonia and TCA-soluble peptides. The increase in certain biogenic amines (putrescine, cadaverine, and spermine) seems to correlate well with decreases observed in firmness, hardness, and chewiness. In addition, a strong relationship was observed between the initial days of storage and instrumental texture parameters, while a significant correlation between the end of the storage and the chemical quality analyses was verified. Firmness, hardness, chewiness, and cohesiveness were considered parameters with high potential in the evaluation of fish freshness during the first days of storage, whereas the chemical quality analyses and springiness were considered important for later evaluation of fish quality. Therefore, instrumental texture parameters may be used as quality indicators in the evaluation of freshwater fish freshness. The printability of materials used in extrusion based 3D printing is one of the most important properties especially when fabricating objects with architectural complexities. However, this parameter is influenced by several factors (temperature, components, and additives) which makes thorough evaluation and classification challenging. 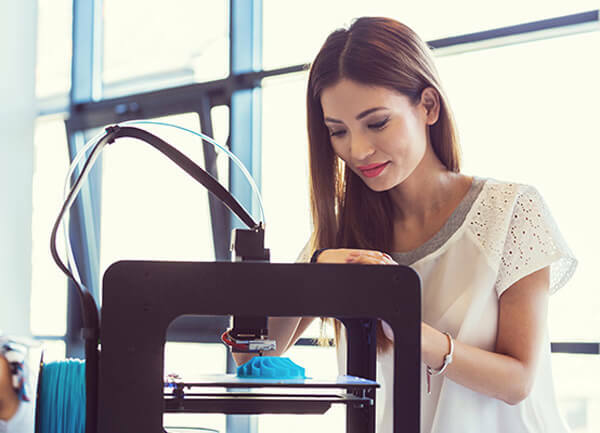 Researchers at Korea University have been investigating the printability of materials used in extrusion-based 3D printing, which is a very important property, particularly in materials with a complex structure. Hydrocolloids were used as a reference material to simulate the printability of various types of food applications. After samples were prepared, they were subject to a number of tests including storage and dimensional stability, an assessment of handling properties and a 3D printing test. Additionally, Texture Profile Analysis was carried out using their TA.XTplus Texture Analyser. The deformation behaviour and handling properties of selected food were classified based on the reference material which enables a printability classification system to be established based on the capability in dimensional stability and degree of handling. Meanwhile, researchers from Jiangnan University have been investigating lemon juice gel as a food material for 3D printing and optimising printing parameters. Among rheological and NMR tests, texture profile analysis was used, carried out on a TA.XT2 Texture Analyser. With the increase of starch content, the hardness, springiness, cohesiveness and gumminess of lemon juice gel was increased to different extents, resulting in a stronger ability to resist external damage. The rheological properties were used as indicators to determine printability and provide basic research on 3D printing for other gel and starch products in this exciting area of new product development.